Place salmon fillet with skin side down in the middle of a large piece of parchment paper; season with salt and black pepper. Cut 2 3-inch slits into the fish with a sharp knife. Stuff chopped basil leaves into the slits. Spray fillet with cooking spray and arrange lemon slices on top. Fold edges of parchment paper over the fish several times to seal into an airtight packet. Place sealed packet onto a baking sheet. 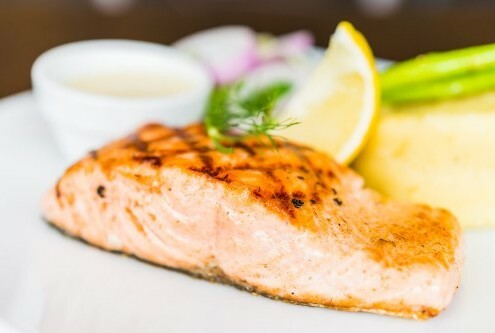 Bake fish on the bottom rack of oven until salmon flakes easily and meat is pink and opaque with an interior of slightly darker pink color, about 25 minutes. An instant-read meat thermometer inserted into the thickest part of the fillet should read at least 145 degrees F (65 degrees C). To serve, cut the parchment paper open and remove lemon slices before plating fish.